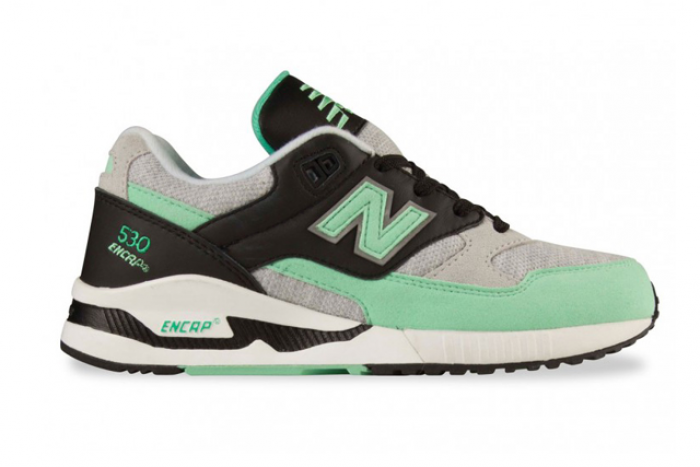 For The Ladies: New Balance 530 "Mint"
Pastels have painted the scene of Spring sneaker collections this year and New Balance is next on deck to do so. The New Balance 530 model features a Mint dress up for the lady sneakerheads of the world, which I'm entirely thankful for! The NB 530 silhouette was designed with premium materials and constructed perfectly in a refreshing Mint hue. Black overlays and Grey jersey cotton criss-cross along the upper while also including the back heel and midfoot of the runner. Mint suede colors the toe box, outsole, and NB embroidered tongue logo. EVA midsoles are sandwiched in-between the signature ENCAP support system specific to the New Balance brand. Get your pair today at your local New Balance retailer.. and don't forget.. they're just for you, ladies!